Millenia Walk is a shopping centre in Singapore, located within the Marina Centre subzone of the Downtown Core Planning Area. Millenia Walk is a premier lifestyle shopping centre defined by a refreshing burst of colour and an invitingly wide and spacious interior. Lifestyle shops specialising in an eclectic array of products and services line the open atrium structure designed by Pritzker Award winning architect Philip Johnson. Situated in the heart of Millenia Singapore, Millenia Walk boasts some of the best flagship stores: Harvey Norman, a specialist in electrical & electronics, IT, furniture and bedding; Cortina Watch Espace Boutique, Asia's largest watch gallery. At the crossroads of the mall is The Great Hall where productions, exhibitions, performances and other exciting attractions are hosted. Here's the our members favorite photos of "Malls near Marina Bay". Upload your photo of Millenia Walk! So far only Deepak Aryal wants to visit Millenia Walk. 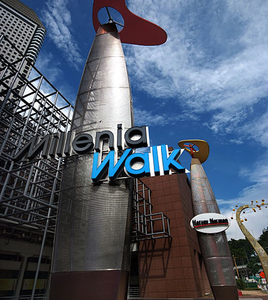 Do you want to visit Millenia Walk Click here?